It goes without saying that maintaining a healthy gastrointestinal system is critical to a patients overall well-being. However, many patients don’t often pro-actively seek out information about core components of GI health or how to restore digestive health for themselves, or their family. It’s only then that they understand the essential, non-GI benefits that a healthy digestive system has – particularly with the immune system. It seems that once a patient learns that 70-90% of the immune system is found in the GI tract that their thirst for knowledge about digestive restoration, namely microflora balance, is born. I often find that patients, especially those who are parents, are surprised, and eager, to learn the origins of our microflora – and of the intricate bacterial balance which starts at birth. During delivery the baby’s GI tract is inoculated with bacteria from mom while passing through the birth canal. Until this point, the GI tract was sterile, and this introduction of bacteria is an integral part of the developing immune system. After delivery, breastfeeding provides the proper nutrition (prebiotics) for beneficial bacteria to thrive. Bifidobacteria colonizations in particular, which are beneficial to have an adequate supply of by two years of age, are found in higher concentrations in breast-fed infants. For children born via C-section, formula fed, or if mom’s digestive health wasn’t optimum at birth, providing proper bacterial balance as early as possible is crucial for development. Healthy food choices that contain probiotics include fermented foods like Greek yogurt, kefi, sauerkraut, kombucha, and miso. Prebiotics, like inulin and fructooligosaccharides which are types of soluble fiber, can be found in root vegetables and provide nutrition for the beneficial bacteria. 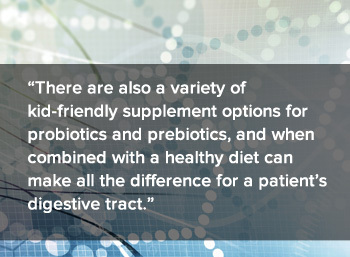 There are also a variety of kid-friendly supplement options for probiotics and prebiotics, and when combined with a healthy diet can make all the difference for a patient’s digestive tract. This information carries value for any patient, but for those who have, or are considering having children, becomes even more significant. As practitioners, we often find ourselves educating patients, the reasons how or why they feel the way they do (and most certainly on the how for improving), but we must remember not to downplay the importance of educating patients on healthy foundations, both for themselves, and their families.